The Ducks traded defenseman Chris Pronger and forward Ryan Dingle to the Flyers for defenseman Luca Sbisa, forward Joffrey Lupul, two first-round picks and a conditional third-round pick in 2010 or 2011. Without doubt, the Pronger trade was consummated because Scott Niedermayer will return for the '09-'10 season. 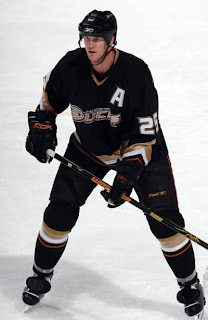 Pronger, 34, had 11 goals and 37 assists in 82 games for Anaheim. Dingle, 25, had 11 goals and 7 assists in 70 games last season with the Iowa Chops of the AHL. Lupul, 25, had 25 goals and 25 assists for the Flyers in 2008-09. Sbisa, 19, had seven assists in 39 games with the Flyers last season, also spending time with the Lethbridge Hurricanes of the WHL and the Philadelphia Phantoms of the AHL. I don't think it is even close. After watching Pronger last season, it is clear that his game is in decline. He often looks undisciplined against skilled forwards and takes too many dumb penalties. His $6.25 million cap cost, at this stage in his career, is no bargain and he becomes a free agent after this upcoming season. Dingle is now 25 and still toiling in the AHL, and smells a lot like a career minor leaguer. Contrastingly, Lupul is nearly ten years younger than Pronger, is a proven 20 goal + forward that is also responsible in his own end. He is signed to a reasonable deal through '12-'13. Sbisa is only 19 and the Italian already has had some exposure to the NHL and appears to have a much greater upside than Dingle. Add to the deal that Philadelphia was required to include 2 first-rounders and a conditional third-round pick and it becomes evident that the Ducks should be arrested for highway robbery!